Skinny Chocolate Chip Banana Muffins is EASY and HEALTHY BREAKFAST RECIPE for busy mornings!!! You should try this Chocolate Chip Banana Bread, too!!! New Year means a fresh start! Many of us make decisions to do something good for ourselves and get rid of bad habits, too. Also, we always want to make a healthy fresh start in New Year! Therefore, we decided to start a diet, go to a gym or at least start eating healthier. The truth is, already after few days most of us will give up and go back to old habits because we’re too busy to take care of healthy eating. It’s good to clean your body from excessive calories, too. That is the reason why I decided to share this recipe for Chocolate Chip Banana Muffins. Today, I want to make a little twist. So I want to start this year with completely different recipe. 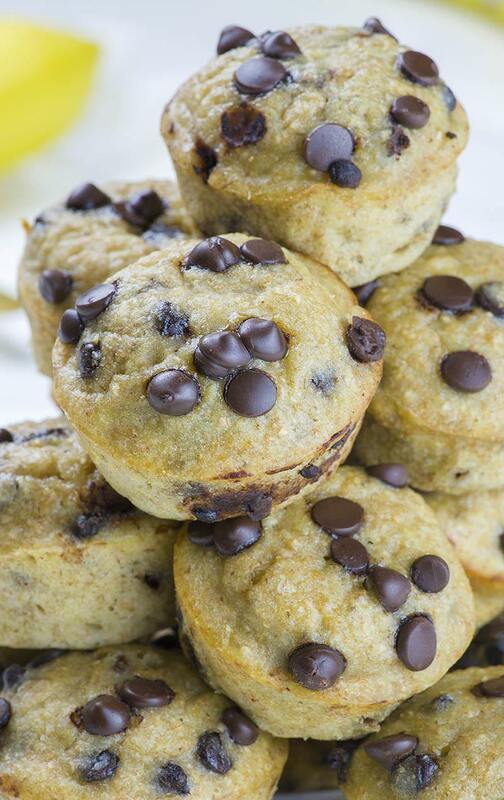 This is EASY and HEALTHY BREAKFAST RECIPE for Skinny Chocolate Chip Banana Muffins. And Skinny Chocolate Chip Banana Muffins is really quick and easy recipe. Moreover, only 30 minutes and a few simple ingredients is all you’ll need to provide yourselves healthy breakfast or snack. Also, you can freeze them and use whenever you need some food to grab and take to work or pack your kid’s lunch box for school. At least, you’ll no longer have any excuse to give up your decision to eat healthy meals. And don’t worry, Banana Muffins are very tasty, too. For sure, you all know that I love rich and decadent desserts, since I shared so many during last few years here on my blog. Surely you remember that I had a lot of recipes for coffee cakes and similar treats. However, I always had the perfect excuse to eat all these desserts for breakfast. Also, there’s no butter, sugar, white flour or other unhealthy ingredients in these muffins. OK, it has some chocolate chips, but it’s dark chocolate. And some dark chocolate is good for your health, right?! But, if you don’t agree, feel free to leave these out or substitute with chopped nuts. These Banana Muffins are healthy and lightened up from the traditional muffin loaded with sugar. Instead of sugar, I used honey as a natural sweetener and the whole wheat flour instead all-purpose flour. And I also substituted butter with plain nonfat Greek yogurt. 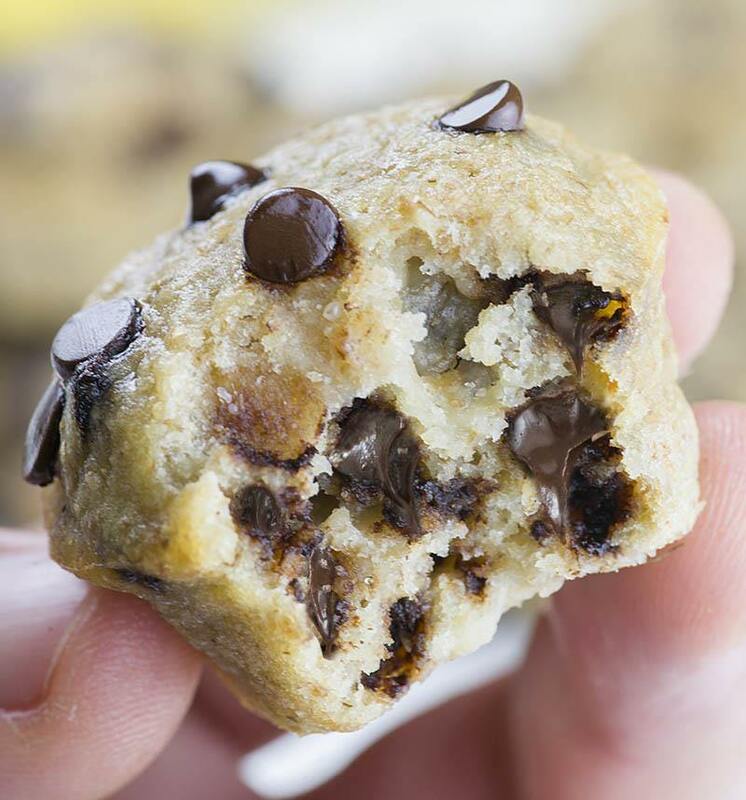 Skinny Chocolate Chip Banana Muffins freeze well, so you can make them for weekend and have a healthy breakfast all week. First, bake them and let cool completely, then warp each one in plastic wrap and place in ziplock bag and freeze for later. That way you can have a healthy food for breakfast even on those busy mornings when you are late for work or have to pack a lunch box for your kids, too. When ready to use, unwrap these mini bites, thaw or microwave and you’re ready to go. 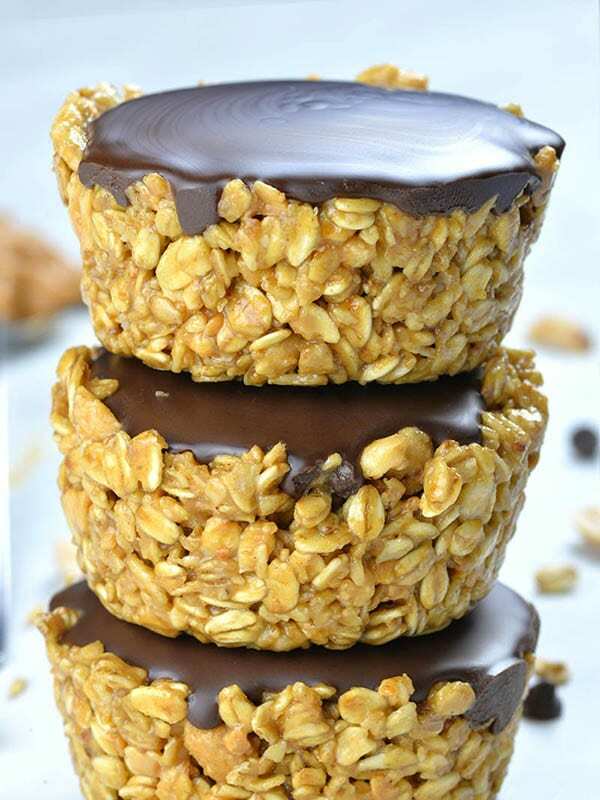 No Bake Peanut Butter Granola Cups are easy and healthy snack for kids and adults and perfect breakfast to grab and go on busy mornings. 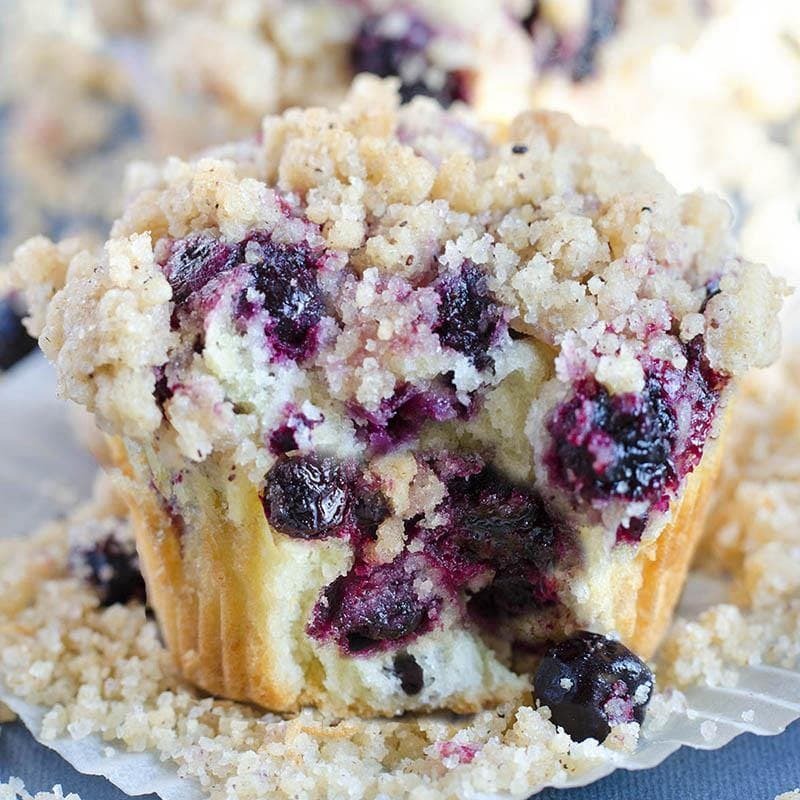 This blueberry muffins recipe will soon become your favorite breakfast recipe keeper! It is perfect if you searching for delicious,refreshing and easy breakfast idea!! 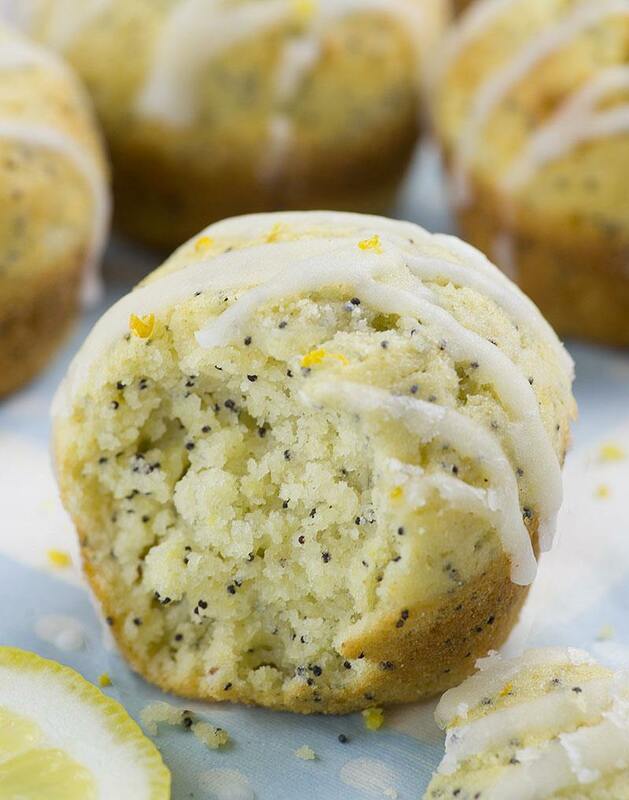 Lemon Poppy Seed Muffins –Simple and easy recipe for bright and sunny breakfast or brunch- moist, lemon infused muffins made with Greek yogurt. Skinny Chocolate Chip Banana Muffins is EASY and HEALTHY BREAKFAST RECIPE for busy mornings!!! Preheat oven to 350 F and spray 12 cup standard muffin tin or 24 cup mini muffin tin with nonstick cooking spray. I used mini muffin tin. First, in a bowl whisk dry ingredients: flour, baking soda, cinnamon and salt. Then, in a large bowl mash bananas. Next, add honey, oil, vanilla, milk, Greek yogurt and egg, then, mix until well combined and smooth. You can use electric mixer or whisk by hand. Add dry ingredients and mix (or whisk)until just combined, too. Finally, fold in chocolate chips. Fill muffin tin with batter almost to the top and bake until the toothpick inserted in the muffin comes out almost clean with a few crumbs attached. It takes about 20-25 minutes for regular sized muffins or 14-16 minutes for mini muffins. Cool the muffins for 5 minutes in the pan, then transfer to a wire rack to cool completely. 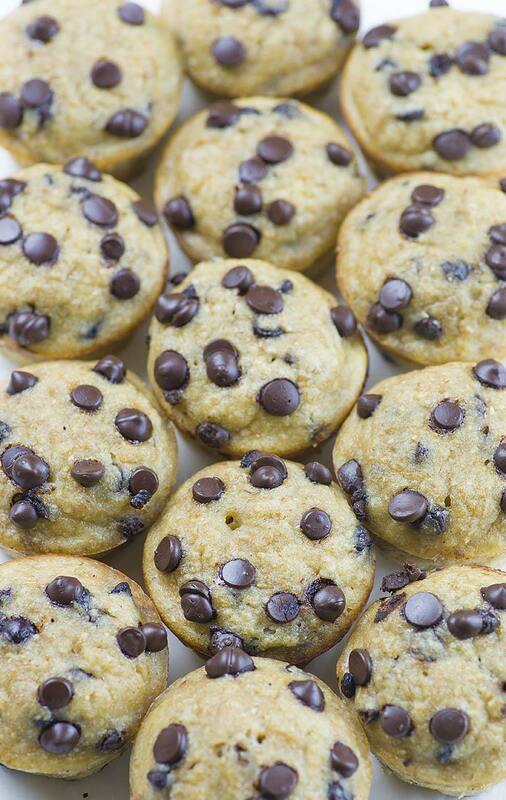 Skinny or not… as soon as I saw chocolate chips and bananas, I knew this was the muffin recipe for me. And since they are skinny, I can afford to eat slightly more the usual lol! I’ll probably be trying this over the weekend. How many calories is this recipe? Where’s the nutrition facts on this? These look wonderful! Do you know how many calories each muffin has? These are good! Thanks for sharing! Did you use white whole wheat flour or regular brown whole wheat? Hi Anne, I used regular whole wheat flour. These are delicious! The recipe came out perfectly as is, with the exception of the quantity – it only made 10 regular-sized muffins for me. It would be great if you can share the nutrition per serving. Thanks for sharing this!! Has anyone tried to make this gluten & lactose free? Hi! I just did this gluten free (I did dairy but I did 1/2 tbsp whole milk 1/2 tbsp water so I imagine you could just use water and maybe applesauce for the yogurt?) I used Cup 4 Cup Wholesome flour — the batter texture is weird but they turned out great! I followed you’re recipe and they didn’t need turn out like the picture. It looks like you used regular flour. Mine were more brown and grainy looking since I used whole wheat flour. Do you know why hey might look different? They were still delicious. Hi Jamie, I’m sorry to hear that. I used whole wheat flour as I said in the recipe. Mine came out like that too, I think it’s because I added Cinnamon, I can’t reason why they look grainy though. i followed it exactly, except for the optional Cinnamon. Maybe diffrent brands do diffrent things? Hi! I’m just wondering, can you use regular all purpose flour? Thank you! Hi Kaitlin, you can try with all purpose flour but I think you should fill the cups about 2/3-3/4 full, it will rise more than these with whole wheat flour. I didn’t have whole wheat so I used regular all purpose and they turned out great still! Also used regular yogurt instead of greek. Really had to make due with what I had. They didn’t rise too much and they’re very soft and fluffy! Can you use regular milk? We don’t use soy/almond milk and I don’t want to buy something we won’t use the rest of! Hi Alex, you can use it. I Made these and they came out just as pictured! Super moist! I used whole wheat flour, but might try half white flour next time. The only modification was that I was out of honey so I substituted maple syrup. Wonderful recipe, thank you for sharing. Please add calorie information; its too easy to move onto the next recipe when the basic information is missing. Otherwise, I would love this. Thank you for sharing! I put this into the recipe section of my fitnesspal and it says that each muffin is about 185 calories. (give or take a few changes I made to the ingredient list ie 1% milk instead of soy). Baked these up so quick this morning, really easy. Used white whole wheat flour and agave nectar. Subbed 100% cacao chips. Not sweet! Which I like very much. Topped with walnuts and nutmeg. Thanks for posting such an easy and healthy recipe! Have you ever tried this recipe with oatmeal instead of flour? I love baked oatmeal muffins. Hi Krista, sorry, I haven’t tried it. I subbed 1/2 cup oat flour for whole wheat flour and still used 1 cup whole wheat flour with it. They turned out great! They were so moist and still rose well, so I might sub more oat flour next time. I did have to cook 10 minutes longer, which is probably due to how the oat flour holds moisture. More oat flour means they might not raise up as much, though. How many mini muffins does this make? I would love to know the nutritional info on these. Can you post please!? These are tasty! Kids loved them too! Do you happen to have nutritional info? What are the caliries on this recipe? I find it a little ridiculous/interesting that this recipe is exactly the same as my skinny chocolate chip banana muffins from 2014. It is very unfortunate that you can’t give credit where credit is due, especially as a blogger. How many calories per muffins ??????? I made this only deviating slightly because allninhad was vanilla yogurt, and I used oats. But all in all they were still amazing ?? Tried this and they turned out pretty good considering I took some liberties. I thought I had all the ingredients but didn’t…I didn’t have enough banana so I added unsweetened applesauce and used whole wheat BREAD flour. I didn’t have plain yogurt so I used lemon flavour. I spilled the vanilla so probably had two tablespoons in there. I made twelve even though “almost to the top” would of been probably 10. I baked for 25min and I am pleased with the results! Because I used lemon,apple, banana, there isn’t a strong flavour of any, but that is OK because it has chocolate chips!! Will definitely make these again. Is there nutritional info available? OMG! Delicious!!!! Wonder how it would turn out in a loaf. I made these and they turned out great! Made 36 rather than 24 mini muffins! I want to try them with less choc chips and some walnuts next time 🙂 I was surprised it used 1 tablespoon of vanilla rather than 1 teaspoon which is most common in other recipes but I went right by the recipe. I followed the recipe exactly and they turned out great! I used a cupcake scooper from pampered chef and got 16 standard muffins out of it. I calculated the calories of all ingredients and I came up with 118 per muffin. I will definitely be making them again! Thanks Angie. I’m glad you like this recipe.Thanks for the comment. Um I cannot tell you how much I want to make these, they look and sound incredible! The combo of choc chips and banana is pretty unbeatable as well. I made these twice. The first time I followed the recipe exactly. Second time I substituted the Greek yogurt with 1/2 cup sour cream. The second time the muffins were fluffier and more moist. I also used mini chocolate chips second time vs regular chocolate chips per request of my kids. They were definitely better. I added as I went (second time) and got about 155 calories per muffin. It made 12 cupcake size muffins. These are a new favorite! Has anyone tried using almond flour? How many weight watchers points per muffin? Hi Sue, sorry, i don’t have that info. Any idea of how many WW points? No sorry. Thanks for stopping by. Can i use plan in yogurt instead of Greek? Hi Sandy, I tried it only with Greek yogurt, but I think it could work, too. Looks delicious! Loved your ideas and thanks lot for sharing this yummy recipe. These are moist and delicious! Great recipe! Can I substitute Almond flour? Hi Lesley, I haven’t tried them with almond flour, sorry! Using a calculator I worked out that there is 126 calories in each muffin. I make these regularly and my family loves them! On WW it comes out to 4 points using fat free Greek yogurt and milk.